Eric Thomson needs life-changing stem cell treatment in Mexico. Fundraisers can put their best foot forward for Hartlepool dad Eric Thomson as he races to reach his final target for pioneering surgery abroad. A fundraising ball will be held in Eric’s honour in an effort to raise the remainder of the £35k needed to send the former Camerons brewery worker to Mexico for stem cell MS treatment on June 20. The Avenue function room in Lauder Street, Hartlepool, will host the event organised by Eric’s sisters Sue Thomson and June Powell on May 6 at 7pm. The event will see a range of raffle prizes donated by Hartlepool businesses backing Eric’s cause. Up for grabs is a meal for four people donated by Beverly Williams and Christine Gardiner from Wedded Bliss; a handbag and jewellery from Karen Coussins at Bridal Boutiques; and a family photo shoot from photographer Gary Coussins. Top prize is a £500 wedding or celebration package, also from Christine Gardiner from Wedded Bliss, which will feature a variety of decorations for a celebration. Fundraiser Angela Crowe said she hopes the event will raise a large amount of the funds needed for Eric. “Eric is stable at the moment but still wobbly on his legs,” she said. 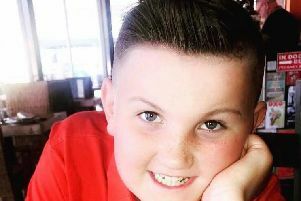 “He has got his appointment for MRI and blood tests in the next few weeks as requested by the clinic in Mexico then they will be all ready to go once flights are booked. The night hopes to raise as much as possible for 49-year-old Mr Thomson’s treatment. Tickets for event will be on sale from The Avenue by calling 01429 867456.